The giant Hugo was a member of the Mad Gear syndicate, but after its collapse, he turned towards the squared circle and used his massive size and power to become a pro wrestler. Boy, I'll say he did! Before joining Street Fighter as "Hugo," he appeared in Final Fight as Andore. The giant. Andore the Giant. Yeah. No surprise he's the biggest Street Fighter around, even towering over Zangief and T. Hawk. He gets a lot of extra pieces to bulk him up, many the same ones that Smart Hulk used. The new pieces are limited to his waist cap (with the large silver chain wrapping around the left side) and the forearms/hands, so he can have his studded bracelets. His hair is also new, and he has a sad, dopey look on his face. I didn't know Heihachi was the villain of Tekken until the movie came out and he was played by Cary-Hiroyuki Tagawa - that guy always plays villains! In fact, he even played Shang Tsung in Mortal Kombat. 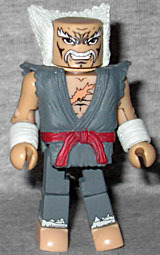 The Minimate is wearing a grey gi with a red belt and a tiger face on the back. He has painted wraps around his ankles, and 3D wraps around his wrists. There's a scar painted on his chest, like Sagat. 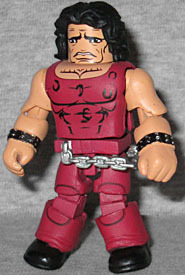 His hairstyle, best described as "bald Wolverine," is accomplished by having the piece connect to a neck ring rather than the top of the head. This is a weird choice for a TRU exclusive set - Hugo is a super niche character, but Heihachi is the main villain; why would he not be available everywhere?